Movie 2 Greek. Omega is the last letter of the Greek alphabet. War Greymon + "Fuse Into the Ultimate Digimon!" Metal Garurumon + "Fuse Into the Ultimate Digimon!" If you win the battle, send all the opponent's Digimon (except Rookies) to the Dark Area. Metal Garurumon + "Fuse Into the Ultimate Digimon!" This multi-type fighter was born from the strong good intentions on the Internet. This fusion is possible only for the Digimon in the Evolution Box. This Digimon goes to the Dark Area after your turn is over. During the battle if the opponent has a Diablomon on their sheet all attack strength is halved. 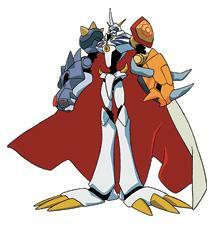 When this Digimon appears you regain 30 points. If you win the battle, the opponent loses an additional 20 points. At the end of the turn you can make one current Field card ineffective. Metal Garurumon + "Fuse Into the Ultimate Digimon!" He bisects his enemies with the power of War Greymon that dwells within his Grey Sword! Has the power of "sky"
At the end of the turn in which you fuse, send this card to the Dark Area. Gabumon + Invisible Connection He defends Yggdrasil's justice, the Royal Knight of destruction! His evolution requirements cannot be ignored. Add 580 attack against Perfect level Red Frame Digimon. He is not affected by "A goes to 0". If you lose the battle and you have Omegamon (Red Frame) in your hand, then you may exchange Omegamon with Omegamon (Red Frame) at the beginning of the Battle Phase.